Breaking the rules has never been more fun in the latest dynamic puzzler from Candy Mobile. Now you can put your grey matter to the test from anywhere with this jail break adventure game designed exclusively for mobiles and tablets. Rated PEGI 7, Break the Prison is ideal for even the youngest gamers, with a comedic storyline of misadventures kids of all ages will love. Players can enjoy hundreds of unique puzzles across 40 individual levels, all packed with mind-bending puzzles and brainteasers, neatly packaged with dynamic graphics and crystal clear music and audio. Break the Prison throws players in at the deep end as they take the role of a man accessed and sentenced for a crime he didn’t commit. With the clock ticking down the date of your execution, time is of the essence, making it high time to escape prison and clear your name. 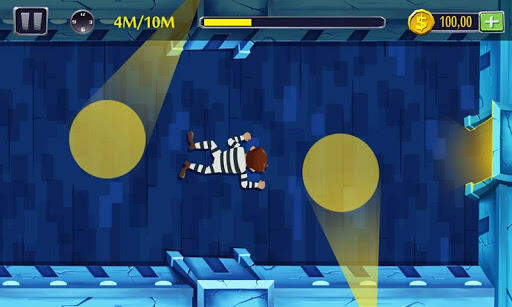 Players must then traverse a series of jail-themed levels, each time fulfilling a different mission brief to make it through to the next area, and eventually, freedom. It’s a race against the clock to scale the prison walls in the shortest time possible. It takes more than just solving the maze of cells and walkways in order to escape the jail in this mind-boggling jail break adventure. Players must collect keys, solve puzzles to decipher the exact escape route, before sneaking underneath the bowels of the prison via a secret tunnel to escape to freedom. With so many levels to explore and secrets to unlock, there’s no chance of getting bored with this family-friendly puzzle game. Download Break the Prison to your phone or tablet device today to get playing. Once you’ve got to grips with the game basics and user-friendly touchscreen controls, it’s time to start playing to win. Take a shot at succeeding in all 40 levels, then post your high-scoring antics online to let friends and family in on the act. You can set a new high-score record and enter the halls of fame, or start up an online tournament to see out of you and your friends can escape the jail in the quickest time possible.